We knew Megan + Brett's beautiful Beaulieu Gardens wedding was truly something special, so we are thrilled it is featured on Carats & Cake! Given the stunning gardens on the estate property, we focused on embracing the property for design with a quintessential wine country estate garden wedding. Their classic and timeless style set the tone for this elegant fete slight touches of Kate Spade in modern accents of black and gold. 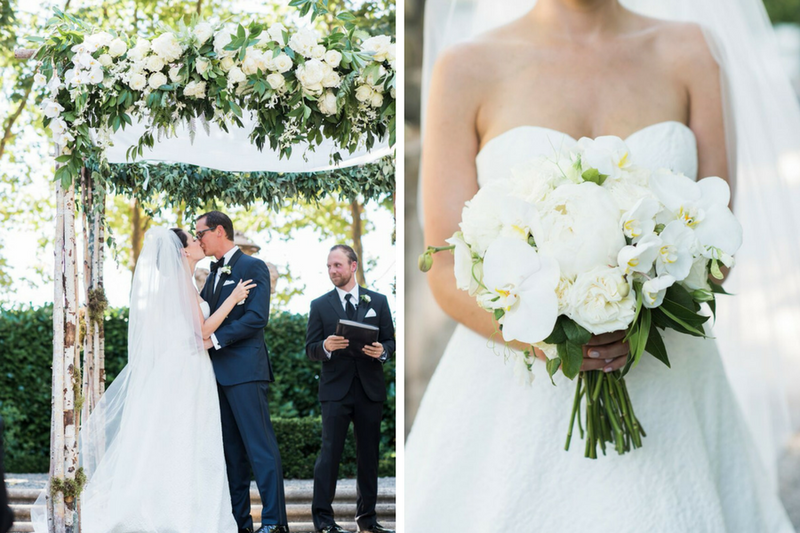 Their ceremony was a dreamy fairy tale surrounded by lush gardens in the courtyard where guests were seated. A whispering fountain set in the center of the courtyard and the bride and groom took center stage under a natural birch arbor adorned with blooms. Guests meandered through the gardens sipping on handcrafted cocktails and champagne before retreating to the lush dining arbor for dinner. Their guests sat at long tables with crystal chandeliers overhead. Each guest had a dedicated seat with their customized menu printed. To see the full feature, click HERE!